We offer technical services with a transparent pricing policy, and aim at a turn-around repair time of 48 hours. We stock all standard computer parts such as main boards, hard drives and optical drives, power supplies and I/O boards. A&A Computers employs eight technicians. Using standardized fault finding procedures almost all equipment can be diagnosed within 15 minutes. Equipment is extensively tested before returning it to the client and comes with three months’ warranty on labour and parts. Many computer faults can be avoided by regular preventive maintenance. Our technicians perform maintenance on site, and at a reduced fee, in our workshop. Junking empty cartridges is an extra strain on the environment. The average toner cartridge can be refilled 2 – 4 times. 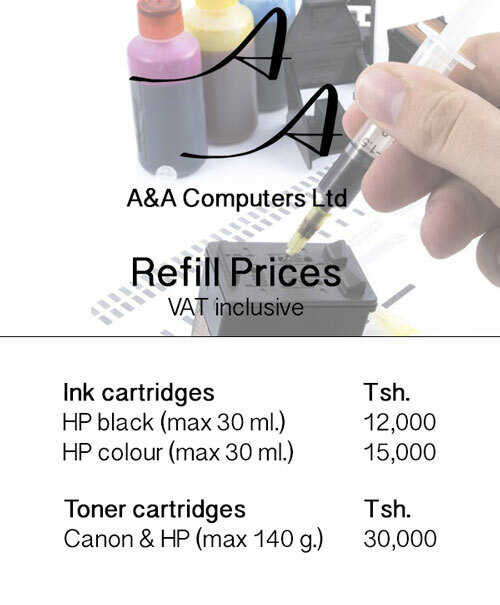 We put in the same amount of toner or ink, or up to 20% more, resulting in up to 60% savings when compared to buying a new cartridge.